Not to be confused with Hattians. Map of the Hittite Empire at its greatest extent, with Hittite rule ca. 1350-1300 BC represented by the green line. The Hittites (/ˈhɪtaɪts/) were an Anatolian people who played an important role in establishing an empire centered on Hattusa in north-central Anatolia around 1600 BC. This empire reached its height during the mid-14th century BC under Suppiluliuma I, when it encompassed an area that included most of Anatolia as well as parts of the northern Levant and Upper Mesopotamia. Between the 15th and 13th centuries BC, the Empire of Hattusa, conventionally called the Hittite Empire, came into conflict with the Egyptian Empire, Middle Assyrian Empire and the empire of the Mitanni for control of the Near East. The Assyrians eventually emerged as the dominant power and annexed much of the Hittite empire, while the remainder was sacked by Phrygian newcomers to the region. After c. 1180 BC, during the Bronze Age collapse, the Hittites splintered into several independent "Neo-Hittite" city-states, some of which survived until the 8th century BC before succumbing to the Neo-Assyrian Empire. The Hittite language was a distinct member of the Anatolian branch of the Indo-European language family, and along with the related Luwian language, is the oldest historically attested Indo-European language. Hittites referred to their native language as nešili "in the language of Nesa" but called their native land as Kingdom of Hattusa (Hatti in Akkadian). The conventional name "Hittites" is due to their initial identification with the Biblical Hittites in 19th century archaeology. Despite their use of the name Hattusa for their state, the Hittites should be distinguished from the Hattians, an earlier people who inhabited the region of Hattusa (until the beginning of the 2nd millennium BC) and spoke an unrelated language known as Hattic. The Hittite empire fell victim to the Bronze Age Collapse around the beginning of the 12th century BC. Ethnic Hittite dynasties survived in small kingdoms scattered around modern Syria, Lebanon and Israel. Lacking a unifying continuity, their descendants are scattered and ultimately have merged into the modern populations of the Levant, Turkey and Mesopotamia. During the 1920s, interest in the Hittites increased with the founding of the modern Republic of Turkey and attracted the attention of Turkish archaeologists such as Halet Çambel and Tahsin Özgüç. During this period, the new field of Hittitology also influenced the naming of institutions, such as the state-owned Etibank ("Hittite bank"), and the foundation of the Museum of Anatolian Civilizations in Ankara, located 200 kilometers west of the Hittite capital and housing the most comprehensive exhibition of Hittite art and artifacts in the world. Before the archeological discoveries that revealed the Hittite civilization, the only source of information about the Hittites had been the Old Testament. Francis William Newman expressed the critical view, common in the early 19th century, that, "no Hittite king could have compared in power to the King of Judah...". As the discoveries in the second half of the 19th century revealed the scale of the Hittite kingdom, Archibald Sayce asserted that, rather than being compared to Judah, the Anatolian civilization "[was] worthy of comparison to the divided Kingdom of Egypt", and was "infinitely more powerful than that of Judah". Sayce and other scholars also noted that Judah and the Hittites were never enemies in the Hebrew texts; in the Book of Kings, they supplied the Israelites with cedar, chariots, and horses, and in the Book of Genesis were a friend and ally to Abraham. Uriah the Hittite was a captain in King David's army and counted as one of his "mighty men" in 1 Chronicles 11. Bronze Hittite figures of animals in the Museum of Anatolian Civilizations. French scholar Charles Texier found the first Hittite ruins in 1834 but did not identify them as Hittite. The first archaeological evidence for the Hittites appeared in tablets found at the karum of Kanesh (now called Kültepe), containing records of trade between Assyrian merchants and a certain "land of Hatti". Some names in the tablets were neither Hattic nor Assyrian, but clearly Indo-European. The script on a monument at Boğazkale by a "People of Hattusas" discovered by William Wright in 1884 was found to match peculiar hieroglyphic scripts from Aleppo and Hama in Northern Syria. In 1887, excavations at Amarna in Egypt uncovered the diplomatic correspondence of Pharaoh Amenhotep III and his son, Akhenaten. Two of the letters from a "kingdom of Kheta"—apparently located in the same general region as the Mesopotamian references to "land of Hatti"—were written in standard Akkadian cuneiform, but in an unknown language; although scholars could read it, no one could understand it. Shortly after this, Sayce proposed that Hatti or Khatti in Anatolia was identical with the "kingdom of Kheta" mentioned in these Egyptian texts, as well as with the biblical Hittites. Others, such as Max Müller, agreed that Khatti was probably Kheta, but proposed connecting it with Biblical Kittim rather than with the Biblical Hittites. Sayce's identification came to be widely accepted over the course of the early 20th century; and the name "Hittite" has become attached to the civilization uncovered at Boğazköy. During sporadic excavations at Boğazköy (Hattusa) that began in 1906, the archaeologist Hugo Winckler found a royal archive with 10,000 tablets, inscribed in cuneiform Akkadian and the same unknown language as the Egyptian letters from Kheta—thus confirming the identity of the two names. He also proved that the ruins at Boğazköy were the remains of the capital of an empire that, at one point, controlled northern Syria. Under the direction of the German Archaeological Institute, excavations at Hattusa have been under way since 1907, with interruptions during the world wars. Kültepe was successfully excavated by Professor Tahsin Özgüç from 1948 until his death in 2005. Smaller scale excavations have also been carried out in the immediate surroundings of Hattusa, including the rock sanctuary of Yazılıkaya, which contains numerous rock reliefs portraying the Hittite rulers and the gods of the Hittite pantheon. The Hittites used a variation of cuneiform called Hittite cuneiform. Archaeological expeditions to Hattusa have discovered entire sets of royal archives on cuneiform tablets, written either in Akkadian, the diplomatic language of the time, or in the various dialects of the Hittite confederation. The Museum of Anatolian Civilizations in Ankara, Turkey houses the richest collection of Hittite and Anatolian artifacts. The Hittite kingdom was centred on the lands surrounding Hattusa and Neša (Kültepe), known as "the land Hatti" (URUHa-at-ti). After Hattusa was made capital, the area encompassed by the bend of the Kızılırmak River (Hittite Marassantiya) was considered the core of the Empire, and some Hittite laws make a distinction between "this side of the river" and "that side of the river". For example, the reward for the capture of an escaped slave after he managed to flee beyond the Halys is higher than that for a slave caught before he could reach the river. To the west and south of the core territory lay the region known as Luwiya in the earliest Hittite texts. This terminology was replaced by the names Arzawa and Kizzuwatna with the rise of those kingdoms. Nevertheless, the Hittites continued to refer to the language that originated in these areas as Luwian. Prior to the rise of Kizzuwatna, the heart of that territory in Cilicia was first referred to by the Hittites as Adaniya. Upon its revolt from the Hittites during the reign of Ammuna, it assumed the name of Kizzuwatna and successfully expanded northward to encompass the lower Anti-Taurus Mountains as well. To the north, lived the mountainous people called the Kaskians. To the southeast of the Hittites lay the Hurrian empire of Mitanni. At its peak, during the reign of Muršili II, the Hittite empire stretched from Arzawa in the west to Mitanni in the east, many of the Kaskian territories to the north including Hayasa-Azzi in the far north-east, and on south into Canaan approximately as far as the southern border of Lebanon, incorporating all of these territories within its domain. 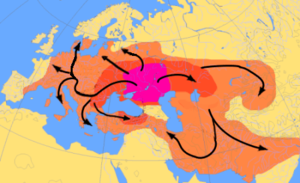 Map of Indo-European migrations from c. 4000 to 1000 BC according to the Kurgan model. The Anatolian migration probably took place across the Balkans. The magenta area corresponds to the assumed Urheimat (Samara culture, Sredny Stog culture). The dark orange area corresponds to the area that may have been settled by Indo-European-speaking peoples up to c. 2500 BC, and the lighter orange area by 1000 BC. It is generally assumed that the Hittites came into Anatolia some time before 2000 BC. While their earlier location is disputed, it has been speculated by scholars for more than a century that the Yamna culture of the Pontic–Caspian steppe, in present-day Ukraine, around the Sea of Azov spoke an early Indo-European language during the third and fourth millennia BC. The arrival of the Hittites in Anatolia in the Bronze Age was one of a superstrate imposing itself on a native culture (in this case over the pre existing Hattians and Hurrians), either by means of conquest or by gradual assimilation. In archaeological terms, relationships of the Hittites to the Ezero culture of the Balkans and Maykop culture of the Caucasus have been considered within the migration framework. The Indo-European element at least establishes Hittite culture as intrusive to Anatolia in scholarly mainstream (excepting the opinions of Colin Renfrew, whose Anatolian hypothesis assumes that Indo-European is indigenous to Anatolia, and, more recently, Quentin Atkinson). According to Anthony, steppe herders, archaic Proto-Indo-European speakers, spread into the lower Danube valley about 4200–4000 BC, either causing or taking advantage of the collapse of Old Europe. Their languages "probably included archaic Proto-Indo-European dialects of the kind partly preserved later in Anatolian." Their descendants later moved into Anatolia at an unknown time but maybe as early as 3000 BC. According to J. P. Mallory it is likely that the Anatolians reached the Near East from the north either via the Balkans or the Caucasus in the 3rd millennium BC. According to Parpola, the appearance of Indo-European speakers from Europe into Anatolia, and the appearance of Hittite, is related to later migrations of Proto-Indo-European speakers from the Yamna-culture into the Danube Valley at c. 2800 BC, which is in line with the "customary" assumption that the Anatolian Indo-European language was introduced into Anatolia somewhere in the third millennium BC. Their movement into the region may have set off a Near East mass migration sometime around 1900 BC. The dominant indigenous inhabitants in central Anatolia at the time were Hurrians and Hattians who spoke non-Indo-European languages. Some have argued that Hattic was a Northwest Caucasian language, but its affiliation remains uncertain, whilst the Hurrian language was a near-isolate (i.e. it was one of only two or three languages in the Hurro-Urartian family). There were also Assyrian colonies in the region during the Old Assyrian Empire (2025–1750 BC); it was from the Assyrian speakers of Upper Mesopotamia that the Hittites adopted the cuneiform script. It took some time before the Hittites established themselves following the collapse of the Old Assyrian Empire in the mid-18th century BC, as is clear from some of the texts included here. For several centuries there were separate Hittite groups, usually centered on various cities. But then strong rulers with their center in Hattusa (modern Boğazkale) succeeded in bringing these together and conquering large parts of central Anatolia to establish the Hittite kingdom. The early history of the Hittite kingdom is known through tablets that may first have been written in the 17th century BC, possibly in Hittite; but survived only as Akkadian copies made in the 14th and 13th centuries BC. These reveal a rivalry within two branches of the royal family up to the Middle Kingdom; a northern branch first based in Zalpuwa and secondarily Hattusa, and a southern branch based in Kussara (still not found) and the former Assyrian colony of Kanesh. These are distinguishable by their names; the northerners retained language isolate Hattian names, and the southerners adopted Indo-European Hittite and Luwian names. Zalpuwa first attacked Kanesh under Uhna in 1833 BC. One set of tablets, known collectively as the Anitta text, begin by telling how Pithana the king of Kussara conquered neighbouring Neša (Kanesh). However, the real subject of these tablets is Pithana's son Anitta (r. 1745–1720 BC), who continued where his father left off and conquered several northern cities: including Hattusa, which he cursed, and also Zalpuwa. This was likely propaganda for the southern branch of the royal family, against the northern branch who had fixed on Hattusa as capital. Another set, the Tale of Zalpuwa, supports Zalpuwa and exonerates the later Ḫattušili I from the charge of sacking Kanesh. Anitta was succeeded by Zuzzu (r. 1720–1710 BC); but sometime in 1710–1705 BC, Kanesh was destroyed, taking the long-established Assyrian merchant trading system with it. A Kussaran noble family survived to contest the Zalpuwan/Hattusan family, though whether these were of the direct line of Anitta is uncertain. Meanwhile, the lords of Zalpa lived on. Huzziya I, descendant of a Huzziya of Zalpa, took over Hatti. His son-in-law Labarna I, a southerner from Hurma (now Kalburabastı) usurped the throne but made sure to adopt Huzziya's grandson Ḫattušili as his own son and heir. The founding of the Hittite Kingdom is attributed to either Labarna I or Hattusili I (the latter might also have had Labarna as a personal name), who conquered the area south and north of Hattusa. Hattusili I campaigned as far as the Semitic Amorite kingdom of Yamkhad in Syria, where he attacked, but did not capture, its capital of Aleppo. Hattusili I did eventually capture Hattusa and was credited for the foundation of the Hittite Empire. According to The Edict of Telepinu, which dates back to the 16th century BC, "Hattusili was king, and his sons, brothers, in-laws, family members, and troops were all united. Wherever he went on campaign he controlled the enemy land with force. He destroyed the lands one after the other, took away their power, and made them the borders of the sea. When he came back from campaign, however, each of his sons went somewhere to a country, and in his hand the great cities prospered. But, when later the princes’ servants became corrupt, they began to devour the properties, conspired constantly against their masters, and began to shed their blood.” This excerpt from the edict is supposed to illustrate the unification, growth, and prosperity of the Hittites under his rule. It also illustrates the corruption of "the princes" who are believed to be his sons. The corruption is dealt with, however, the lack of sources leads to uncertainty with how the corruption was dealt with. On Hattusili I's deathbed, he chose his grandson, Mursuli I, as his heir. Mursili I conquered that city in a campaign conducted against the Amorites in 1595 BC (middle chronology). The İnandık vase, a Hittite four-handled large terracota vase with scenes in relief depicting a sacred wedding ceremony, mid 17th century BC. İnandıktepe, Museum of Anatolian Civilizations, Ankara. Also in 1595 BC, Mursili I (or Murshilish I) conducted a great raid down the Euphrates River, bypassing Assyria and captured Mari and Babylonia, ejecting the Amorite founders of the Babylonian state in the process. However, the Hittite campaigns caused internal dissension which forced a withdrawal of troops to the Hittite homelands. Throughout the remainder of the 16th century BC, the Hittite kings were held to their homelands by dynastic quarrels and warfare with the Hurrians—their neighbours to the east. Also the campaigns into Amurru (modern Syria) and southern Mesopotamia may be responsible for the reintroduction of cuneiform writing into Anatolia, since the Hittite script is quite different from the script of the preceding Assyrian Colonial period. Mursili continued the conquests of Hattusili I. Mursili's conquests reached southern Mesopotamia and even ransacked Babylon itself in 1531 BC (short chronology). Rather than incorporate Babylonia into Hittite domains, Mursili seems to have instead turned control of Babylonia over to his Kassite allies, who were to rule it for the next four centuries. This lengthy campaign, however, strained the resources of Hatti, and left the capital in a state of near-anarchy. Mursili was assassinated shortly after his return home, and the Hittite Kingdom was plunged into chaos. The Hurrians (under the control of an Indo-Aryan Mitanni ruling class), a people living in the mountainous region along the upper Tigris and Euphrates rivers in modern south east Turkey, took advantage of the situation to seize Aleppo and the surrounding areas for themselves, as well as the coastal region of Adaniya, renaming it Kizzuwatna (later Cilicia). Following this, the Hittites entered a weak phase of obscure records, insignificant rulers, and reduced area of control. This pattern of expansion under strong kings followed by contraction under weaker ones, was to be repeated over and over again throughout the Hittite Kingdom's 500-year history, making events during the waning periods difficult to reconstruct with much precision. The political instability of these years of the Old Hittite Kingdom, can be explained in part by the nature of the Hittite kingship at that time. During the Old Hittite Kingdom period prior to 1400 BC, the king of the Hittites was not viewed by the Hittite citizenry as a "living god", like the Pharaohs of Egypt, but rather as a first among equals. Only in the later period of the Hittite Empire, from 1400 BC until 1200 BC, did the kingship of the Hittites become more centralized and powerful. Also in earlier years the succession was not legally fixed, enabling the "war of the Roses" style rivalries between northern and southern branches. The next monarch of any note following Mursili I was Telepinu (c. 1500 BC), who won a few victories to the southwest, apparently by allying himself with one Hurrian state (Kizzuwatna) against another (Mitanni). Telepinu also attempted to secure the lines of succession. The last monarch of the Old kingdom, Telepinu, reigned until about 1500 BC. Telepinu's reign marked the end of the "Old Kingdom" and the beginning of the lengthy weak phase known as the "Middle Kingdom". The period of the 15th century BC is largely unknown with very sparse surviving records. Part of the reason for both the weakness and the obscurity is that the Hittites were under constant attack, mainly from the Kaska, a non Indo-European people settled along the shores of the Black Sea. The capital once again went on the move, first to Sapinuwa and then to Samuha. There is an archive in Sapinuwa but it has not been adequately translated to date. It segues into the "Hittite Empire period" proper, which dates from the reign of Tudhaliya I from c. 1430 BC. One innovation that can be credited to these early Hittite rulers is the practice of conducting treaties and alliances with neighboring states; the Hittites were thus among the earliest known pioneers in the art of international politics and diplomacy. This is also when the Hittite religion adopted several gods and rituals from the Hurrians. Hittite monument, an exact replica of monument from Fasıllar in Museum of Anatolian Civilizations, Ankara. With the reign of Tudhaliya I (who may actually not have been the first of that name; see also Tudhaliya), the Hittite Kingdom re-emerged from the fog of obscurity. Hittite civilization entered the period of time called the "Hittite Empire period". Many changes were afoot during this time, not the least of which was a strengthening of the kingship. Settlement of the Hittites progressed in the Empire period. However, the Hittite people tended to settle in the older lands of south Anatolia rather than the lands of the Aegean. As this settlement progressed, treaties were signed with neighboring peoples. During the Hittite Empire period the kingship became hereditary and the king took on a "superhuman aura" and began to be referred to by the Hittite citizens as "My Sun". The kings of the Empire period began acting as a high priest for the whole kingdom—making an annual tour of the Hittite holy cities, conducting festivals and supervising the upkeep of the sanctuaries. During his reign (c. 1400 BC), King Tudhaliya I, again allied with Kizzuwatna, then vanquished the Hurrian states of Aleppo and Mitanni, and expanded to the west at the expense of Arzawa (a Luwian state). Another weak phase followed Tudhaliya I, and the Hittites' enemies from all directions were able to advance even to Hattusa and raze it. However, the Kingdom recovered its former glory under Suppiluliuma I (c. 1350 BC), who again conquered Aleppo, Mitanni was reduced to vassalage by the Assyrians under his son-in-law, and he defeated Carchemish, another Amorite city-state. With his own sons placed over all of these new conquests, Babylonia still in the hands of the allied Kassites, this left Suppiluliuma the supreme power broker in the known world, alongside Assyria and Egypt, and it was not long before Egypt was seeking an alliance by marriage of another of his sons with the widow of Tutankhamen. Unfortunately, that son was evidently murdered before reaching his destination, and this alliance was never consummated. However, the Middle Assyrian Empire (1365–1050 BC) once more began to grow in power also, with the ascension of Ashur-uballit I in 1365 BC. Ashur-uballit I attacked and defeated Mattiwaza the Mitanni king despite attempts by the Hittite king Suppiluliumas I, now fearful of growing Assyrian power, attempting to preserve his throne with military support. The lands of the Mitanni and Hurrians were duly appropriated by Assyria, enabling it to encroach on Hittite territory in eastern Asia Minor, and Adad-nirari I annexed Carchemish and north east Syria from the control of the Hittites. After Suppiluliumas I, and a very brief reign by his eldest son, another son, Mursili II became king (c. 1330). Having inherited a position of strength in the east, Mursili was able to turn his attention to the west, where he attacked Arzawa and a city known as Millawanda (Miletus), which was under the control of Ahhiyawa. More recent research based on new readings and interpretations of the Hittite texts, as well as of the material evidence for Mycenaean contacts with the Anatolian mainland, came to the conclusion that Ahhiyawa referred to Mycenaean Greece, or at least to a part of it. Egyptian pharaoh Ramesses II storming the Hittite fortress of Dapur. Hittite prosperity was mostly dependent on control of the trade routes and metal sources. Because of the importance of Northern Syria to the vital routes linking the Cilician gates with Mesopotamia, defense of this area was crucial, and was soon put to the test by Egyptian expansion under Pharaoh Ramesses II. The outcome of the battle is uncertain, though it seems that the timely arrival of Egyptian reinforcements prevented total Hittite victory. The Egyptians forced the Hittites to take refuge in the fortress of Kadesh, but their own losses prevented them from sustaining a siege. This battle took place in the 5th year of Ramesses (c. 1274 BC by the most commonly used chronology). After this date, the power of both the Hittites and Egyptians began to decline yet again because of the power of the Assyrians. The Assyrian king Shalmaneser I had seized the opportunity to vanquish Hurria and Mitanni, occupy their lands, and expand up to the head of the Euphrates in Anatolia and into Babylonia, Ancient Iran, Aram (Syria), Canaan (Israel) and Phoenicia, while Muwatalli was preoccupied with the Egyptians. The Hittites had vainly tried to preserve the Mitanni kingdom with military support. Assyria now posed just as great a threat to Hittite trade routes as Egypt ever had. Muwatalli's son, Urhi-Teshub, took the throne and ruled as king for seven years as Mursili III before being ousted by his uncle, Hattusili III after a brief civil war. In response to increasing Assyrian annexation of Hittite territory, he concluded a peace and alliance with Ramesses II (also fearful of Assyria), presenting his daughter's hand in marriage to the Pharaoh. The "Treaty of Kadesh", one of the oldest completely surviving treaties in history, fixed their mutual boundaries in southern Canaan, and was signed in the 21st year of Rameses (c. 1258 BC). 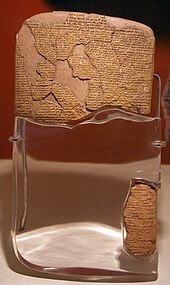 Terms of this treaty included the marriage of one of the Hittite princesses to Ramesses. Hattusili's son, Tudhaliya IV, was the last strong Hittite king able to keep the Assyrians out of the Hittite heartland to some degree at least, though he too lost much territory to them, and was heavily defeated by Tukulti-Ninurta I of Assyria in the Battle of Nihriya. He even temporarily annexed the Greek island of Cyprus, before that too fell to Assyria. The very last king, Suppiluliuma II also managed to win some victories, including a naval battle against Alashiya off the coast of Cyprus. But the Assyrians, under Ashur-resh-ishi I had by this time annexed much Hittite territory in Asia Minor and Syria, driving out and defeating the Babylonian king Nebuchadnezzar I in the process, who also had eyes on Hittite lands. The Sea Peoples had already begun their push down the Mediterranean coastline, starting from the Aegean, and continuing all the way to Canaan, founding the state of Philistia—taking Cilicia and Cyprus away from the Hittites en route and cutting off their coveted trade routes. This left the Hittite homelands vulnerable to attack from all directions, and Hattusa was burnt to the ground sometime around 1180 BC following a combined onslaught from new waves of invaders, the Kaskas, Phrygians and Bryges. The Hittite Kingdom thus vanished from historical records, much of the territory being seized by Assyria. While the attacks from the Sea People and aggressive tribes, known as the Gasga, pushed the Hittites towards the end of Hittite power, many internal issues also led to the end of the Hittite kingdom. The end of the kingdom was part of the larger Bronze Age Collapse. Neo-Hittite storm god "Tarhunzas" in Aleppo museum. By 1160 BC, the political situation in Asia Minor looked vastly different from that of only 25 years earlier. In that year, the Assyrian king Tiglath-Pileser I was defeating the Mushku (Phrygians) who had been attempting to press into Assyrian colonies in southern Anatolia from the Anatolian highlands, and the Kaska people, the Hittites' old enemies from the northern hill-country between Hatti and the Black Sea, seem to have joined them soon after. The Phrygians had apparently overrun Cappadocia from the West, with recently discovered epigraphic evidence confirming their origins as the Balkan "Bryges" tribe, forced out by the Macedonians. Although the Hittite kingdom disappeared from Anatolia at this point, there emerged a number of so-called Neo-Hittite kingdoms in Anatolia and northern Syria. They were the successors of the Hittite Kingdom. The most notable Syrian Neo-Hittite kingdoms were those at Carchemish and Milid (near the later Melitene). These Neo-Hittite Kingdoms gradually fell under the control of the Neo Assyrian Empire (911–608 BC). Carchemish and Milid were made vassals of Assyria under Shalmaneser III (858–823 BC), and fully incorporated into Assyria during the reign of Sargon II (722–705 BC). A large and powerful state known as Tabal occupied much of southern Anatolia. Known as Gk. Τιβαρηνοί Tibarenoi, Lat. Tibareni, Thobeles in Josephus, their language may have been Luwian, testified to by monuments written using Luwian hieroglyphics. This state too was conquered and incorporated into the vast Assyrian Empire. Ultimately, both Luwian hieroglyphs and cuneiform were rendered obsolete by an innovation, the alphabet, which seems to have entered Anatolia simultaneously from the Aegean (with the Bryges, who changed their name to Phrygians), and from the Phoenicians and neighboring peoples in Syria. The head of the Hittite state was the king, followed by the heir-apparent. The king was the supreme ruler of the land, in charge of being a military commander, judicial authority, as well as a high priest. However, some officials exercised independent authority over various branches of the government. One of the most important of these posts in the Hittite society was that of the Gal Mesedi (Chief of the Royal Bodyguards). It was superseded by the rank of the Gal Gestin (Chief of the Wine Stewards), who, like the Gal Mesedi, was generally a member of the royal family. The kingdom's bureaucracy was headed by the Gal Dubsar (Chief of the Scribes), whose authority didn't extend over the Lugal Dubsar, the king's personal scribe. In Egyptian inscriptions dating back before the days of the Exodus, Egyptian monarchs were engaged with two chief seats, located at Kadesh (a Hittite city located on the Orontes River) and Carchemish (located on the Euphrates river in Southern Anatolia). In the Central Anatolian settlement of Ankuwa, home of the pre-Hittite goddess Kattaha and the worship of other Hattic deities illustrates the ethnic differences in the areas the Hittites tried to control. Kattaha was originally given the name Hannikkun. The usage of the term Kattaha over Hannikkun, according to Ronald Gorny (head of the Alisar regional project in Turkey), was a device to downgrade the Pre-Hittite identity of this female deity, and to bring her more in touch with the Hittite tradition. Their reconfiguration of Gods throughout their early history such as with Kattaha was a way of legitimizing their authority and to avoid conflicting ideologies in newly included regions and settlements. By transforming local deities to fit their own customs, the Hittites hoped that the traditional beliefs of these communities would understand and accept the changes to become better suited for the Hittite political and economic goals. In 1595 BC, King Marsilis I (r. 1556–1526 BC) marched into the city of Babylon and sacked the city. Due to fear of revolts at home he did not remain there long, quickly returning to his capital of Hattusa. On his journey back to Hattusa, he was assassinated by his brother-in-law Hantili I, who then took the throne. Hantili was able to escape multiple murder attempts on himself, however, his family did not. His wife, Harapsili and her son were murdered. In addition, other members of the royal family were killed by Zindata I, who was then murdered by his own son, Ammunna. All of the internal unrest among the Hittite royal family led to a decline of power. This led to surrounding kingdoms, such as the Hurrians, to have success against Hittite forces and be the center of power in the Anatolian region. King Telipinus (reigned c. 1525 – c. 1500 BC) is considered to be the last king of the Old Kingdom of the Hittites. He seized power during a dynastic power struggle. During his reign, he wanted to take care of lawlessness and regulate royal succession. He then issued the Edict of Telipinus. Within this edict, he designated the pankus, which was a "general assembly" that acted as a high court. Crimes such as murder were observed and judged by the Pankus. Kings were also subject to jurisdiction under the Pankus. The Pankus also served as an advisory council for the king. The rules and regulations set out by the Edict and the establishment of the Pankus proved to be very successful and lasted all the way through to the new Kingdom in the 14th century BC. The Pankus established a legal code where violence was not a punishment for a crime. Crimes such as a murder and theft, which were punishable by death in other southwest Asian Kingdoms at this time, were not under the Hittite law code. Most penalties for crimes involved restitution. For example, in cases of thievery, the punishment of that crime would to be to repay what was stolen in equal value. Bronze tablet from Çorum-Boğazköy dating from 1235 BC. Photographed at Museum of Anatolian Civilizations, Ankara. The Hittite language is recorded fragmentarily from about the 19th century BC (in the Kültepe texts, see Ishara). It remained in use until about 1100 BC. Hittite is the best attested member of the Anatolian branch of the Indo-European language family, and the Indo-European language for which the earliest surviving written attestation exists, with isolated Hittite loanwords and numerous personal names appearing in an Old Assyrian context from as early as the 20th century BC. "The present work undertakes to establish the nature and structure of the hitherto mysterious language of the Hittites, and to decipher this language [...] It will be shown that Hittite is in the main an Indo-European language." The decipherment famously led to the confirmation of the laryngeal theory in Indo-European linguistics, which had been predicted several decades before. Due to its marked differences in its structure and phonology, some early philologists, most notably Warren Cowgill, had even argued that it should be classified as a sister language to Indo-European languages (Indo-Hittite), rather than a daughter language. By the end of the Hittite Empire, the Hittite language had become a written language of administration and diplomatic correspondence. The population of most of the Hittite Empire by this time spoke Luwian dialects, another Indo-European language of the Anatolian family that had originated to the west of the Hittite region. According to Craig Melchert, the current tendency is to suppose that Proto-Indo-European evolved, and that the "prehistoric speakers" of Anatolian became isolated "from the rest of the PIE speech community, so as not to share in some common innovations." Hittite, as well as its Anatolian cousins, split off from Proto-Indo-European at an early stage, thereby preserving archaisms that were later lost in the other Indo-European languages. In Hittite there are many loanwords, particularly religious vocabulary, from the non-Indo-European Hurrian and Hattic languages. The latter was the language of the Hattians, the local inhabitants of the land of Hatti before being absorbed or displaced by the Hittites. Sacred and magical texts from Hattusa were often written in Hattic, Hurrian, and Luwian, even after Hittite became the norm for other writings. Given the size of the empire, there are relatively few remains of Hittite art. These include some impressive monumental carvings, a number of rock reliefs, as well as metalwork, in particular the Alaca Höyük bronze standards, carved ivory, and ceramics, including the Hüseyindede vases. The Sphinx Gates of Alaca Höyük and Hattusa, with the monument at the spring of Eflatun Pınar, are among the largest constructed sculptures, along with a number of large recumbent lions, of which the Lion of Babylon statue at Babylon is the largest, if it is indeed Hittite. Unfortunately, nearly all are notably worn. Rock reliefs include the Hanyeri relief, and Hemite relief. The Niğde Stele is a Neo-Hittite monument from the modern Turkish city of Niğde, which dates from the end of the 8th century BC. Stag statuette, symbol of a Hittite male god in Museum of Anatolian Civilizations, Ankara. This figure is used for the Hacettepe University emblem. Hittite religion and mythology were heavily influenced by their Hattic, Mesopotamian, and Hurrian counterparts. In earlier times, Indo-European elements may still be clearly discerned. 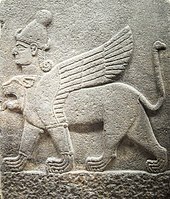 Storm gods were prominent in the Hittite pantheon. Tarhunt (Hurrian's Teshub) was referred to as 'The Conqueror', 'The king of Kummiya', 'King of Heaven', 'Lord of the land of Hatti'. He was chief among the gods and his symbol is the bull. As Teshub he was depicted as a bearded man astride two mountains and bearing a club. He was the god of battle and victory, especially when the conflict involved a foreign power. Teshub was also known for his conflict with the serpent Illuyanka. Hittite laws, much like other records of the empire, are recorded on cuneiform tablets made from baked clay. What is understood to be the Hittite Law Code comes mainly from two clay tablets, each containing 186 articles, and are a collection of practiced laws from across the early Hittite Kingdom. In addition to the tablets, monuments bearing Hittite cuneiform inscriptions can be found in central Anatolia describing the government and law codes of the empire. The tablets and monuments date from the Old Hittite Kingdom (1650–1500 BC) to what is known as the New Hittite Kingdom (1500–1180 BC). Between these time periods, different translations can be found that modernize the language and create a series of legal reforms in which many crimes are given more humane punishments. These changes could possibly be attributed to the rise of new and different kings throughout the history empire or to the new translations that change the language used in the law codes. In either case, the law codes of the Hittites provide very specific fines or punishments that are to be issued for specific crimes and have many similarities to Biblical laws found in the books of Exodus and Deuteronomy. In addition to criminal punishments, the law codes also provide instruction on certain situations such as inheritance and death. The law articles used by the Hittites most often outline very specific crimes or offenses, either against the state or against other individuals, and provide a sentence for these offenses. The laws carved in the tablets are an assembly of established social conventions from across the empire. Hittite laws at this time have a prominent lack of equality in punishments In many cases, distinct punishments or compensations for men and women are listed. Free men most often received more compensation for offenses against them than free women did. Slaves, male or female, had very little rights, and could easily be punished or executed by their masters for crimes. Most articles describe destruction of property and personal injury, to which the most common sentence was payment for compensation of the lost property. Again, in these cases men oftentimes receive a greater amount of compensation than women. Other articles describe how marriage of slaves and free individuals should be handled. In any case of separation or estrangement, the free individual, male or female, would keep all but one child that resulted from the marriage. Another thing to note is that homosexuality is not mentioned in any of the law articles of the Hittite Empire. Cases in which capital punishment is recommended in the articles most often seem to come from pre-reform sentences for severe crimes and prohibited sexual pairings. Many of these cases include public torture and execution as punishment for serious crimes against religion. Most of these sentences would begin to go away in the later stages of the Hittite Empire as major law reforms began to occur. While different translations of laws can be seen throughout the history of the empire, the Hittite outlook of law was originally founded on religion and were intended to preserve the authority of the state. Additionally, punishments had the goal of crime prevention and the protection of individual property rights. The goals of crime prevention can be seen in the severity of the punishments issued for certain crimes. Capital punishment and torture are specifically mentioned as punishment for more severe crimes against religion and harsh fines for the loss of private property or life. The tablets also describe the ability of the king to pardon certain crimes, but specifically prohibit an individual being pardoned for murder. At some point in the 16th or 15th century BC, Hittite law codes move away from torture and capital punishment and to more humanitarian forms of punishments, such as fines. Where the old law system was based on retaliation and retribution for crimes, the new system saw punishments that were much more mild, favoring monetary compensation over physical or capital punishment. Why these drastic reforms happened is not exactly clear, but it is likely that punishing murder with execution was deemed not to benefit any individual or family involved. These reforms were not just seen in the realm of capital punishment. Where major fines were to be paid, a severe reduction in penalty can be seen. For example, prior to these major reforms, the payment to be made for the theft of an animal was thirty times the animal's value; after the reforms, the penalty was reduced to half the original fine. Simultaneously, attempts to modernize the language and change the verbiage used in the law codes can be seen during this period of reform. Under both the old and reformed Hittite law codes, three main types of punishment can be seen: Death, torture, or compensation/fines. The articles outlined on the cuneiform tablets provide very specific punishments for crimes committed against the Hittite religion or against individuals. In many, but not all cases, articles describing similar laws are grouped together. More than a dozen consecutive articles describe what are known to be permitted and prohibited sexual pairings. These pairings mostly describe men (sometimes specifically referred to as free men, sometimes just men in general) having relations, be it consensual or not, with animals, step-family, relatives of spouses, or concubines. Many of these articles do not provide specific punishments but, prior to the law reforms, crimes against religion were most often punishable by death. These include incestuous marriages and sexual relations with certain animals. For example, one article states, "If a man has sexual relations with a cow, it is an unpermitted sexual pairing: he will be put to death." Similar relations with horses and mules were not subject to capital punishment, but the offender could not become a priest afterwards. Actions at the expense of other individuals most often see the offender paying some sort of compensation, be it in the form money, animals, or land. These actions could include the destruction of farmlands, death or injury of livestock, or assault of an individual. Several articles also specifically mention acts of the gods. If an animal were to die by certain circumstances, the individual could claim that it died by the hand of a god. Swearing that what they claim was true, it seems that they were exempt from paying compensation to the animal's owner. Injuries inflicted upon animals owned by another individual are almost always compensated with either direct payment, or trading the injured animal with a healthy one owned by the offender. Not all laws prescribed in the tablets deal with criminal punishment. For example, the instructions of how the marriage of slaves and division of their children are given in a group of articles, "The slave woman shall take most of the children, with the male slave taking one child." Similar instructions are given to the marriage of free individuals and slaves. Other actions include how breaking of engagements are to be handled. The Bible refers to "Hittites" in several passages, ranging from Genesis to the post-Exilic Ezra–Nehemiah. Genesis 10 (the Generations of Noah) links them to an eponymous ancestor Heth, a descendant of Ham through his son, Canaan. The Hittites are thereby counted among the Canaanites. The Hittites are usually depicted as a people living among the Israelites—Abraham purchases the Patriarchal burial-plot of Machpelah from "Ephron HaChiti", Ephron the Hittite; and Hittites serve as high military officers in David's army. In 2 Kings 7:6, however, they are a people with their own kingdoms (the passage refers to "kings" in the plural), apparently located outside geographic Canaan, and sufficiently powerful to put a Syrian army to flight. It is a matter of considerable scholarly debate whether the biblical "Hittites" signified any or all of: 1) the original Hattians; 2) their Indo-European conquerors, who retained the name "Hatti" for Central Anatolia, and are today referred to as the "Hittites" (the subject of this article); or 3) a Canaanite group who may or may not have been related to either or both of the Anatolian groups, and who also may or may not be identical with the later Syro-Hittite states. Other biblical scholars (following Max Müller) have argued that, rather than being connected with Heth, son of Canaan, the Anatolian land of Hatti was instead mentioned in Old Testament literature and apocrypha as "Kittim" (Chittim), a people said to be named for a son of Javan. ^ "2006-05-02 Hittite". 7 July 2004. ^ Ardzinba, Vladislav. (1974): Some Notes on the Typological Affinity Between Hattian and Northwest Caucasian (Abkhazo-Adygian) Languages. In: "Internationale Tagung der Keilschriftforscher der sozialistischen Länder", Budapest, 23.-25. April 1974. Zusammenfassung der Vorträge (Assyriologica 1), p. 10-15. ^ "Hittites". British Museum. London: Trustees of the British Museum. Retrieved 7 November 2014. ^ Spielvogel, Jackson (January 1, 2011). Western Civilization. Boston, MA: Wadsworth Cengage Learning. p. 30. ISBN 9781111342142. ^ Texier, Charles (1835). "Rapport lu, le 15 mai 1835, à l'Académie royale des Inscriptions et Belles-lettres de l'Institut, sur un envoi fait par M. Texier, et contenant les dessins de bas-reliefs découverts par lui près du village de Bogaz-Keui, dans l'Asie mineure" [Report read on 15 May 1835 to the Royal Academy of Inscriptions and Belle-lettres of the Institute, on a dispatch made by Mr. Texier and containing drawings of bas-reliefs discovered by him near the village of Bogaz-Keui [now: Boğazkale] in Asia Minor]. Journal des Savants (in French): 368–376. ^ Kloekhorst, Alwin. "Personal names from Kaniš: the oldest Indo-European linguistic material". ^ Beal, Richard H, "The History of Kizzuwatna and the Date of the Šunaššura Treaty", Orientalia 55 (1986) pp. 424ff. ^ Mallory, J. P.; Adams, Douglas Q. (1997). Encyclopedia of Indo-European culture. Taylor & Francis. pp. 4–6. ISBN 978-1-884964-98-5. Retrieved 24 March 2012. ^ Puhvel, J. (1994). "Anatolian: Autochton or Interloper". Journal of Indo-European Studies. 22 (3 & 4): 251–264 . ^ a b Steiner, G. (1990). "The Immigration of the First Indo-Europeans into Anatolia Reconsidered". Journal of Indo-European Studies. 18 (1 & 2): 185–214 . ^ Mallory, J. (1989). "In Search of the Indo-Europeans". New York: Thames and Hudson . ^ Renfrew, C. (1999). "Time Depth, Convergence Theory, and Innovation in Proto-Indo-European: 'Old Europe' as a PIE Linguistic Area". Journal of Indo-European Studies. 27 (3 & 4): 257–294 . ^ Renfrew, C. (1987). "Archaeology and Language. The puzzle of Indo-European Origins". Cambridge University Press . ^ Anthony 2007, p. 133. ^ Anthony 2007, p. 229. ^ Anthony 2007, p. 262. ^ Mallory & Adams 1997, pp. 12–16. ^ Parpola 2015, p. 37-38. ^ Anthony 2007, p. 345, 361-367. ^ "Anatolian languages". Encyclopædia Britannica Online. Retrieved 1 May 2016. ^ Lehmann, Winfred P.; Slocum, Jonathan. "Hittite Online". Linguistics Research Center. University of Texas at Austin: College of Liberal Arts. Archived from the original on 12 April 2010. Retrieved 12 April 2010. ^ Archi, Alfonso (2010). "When Did the Hittites Begin to Write in Hittite?". In Cohen, Yoram; Gilan, Amir; Miller, Jared L. Pax Hethitica: Studies on the Hittites and Their Neighbours in Honour of Itamar Singer. Otto Harrassowitz Verlag. p. 37f. ^ Kuhrt, Amélie (1995). The Ancient Near East, Volume I. London and New York: Routledge. pp. 226–27. ISBN 978-0-415-16763-5. ^ Bryce, 2005, Chs. 2 and 4; Forlanini. ^ Mark, Joshua (28 April 2011). "The Hittites". Retrieved 9 May 2017. ^ Roebuck, Carl (1966). The World of Ancient Times. New York: Charles Schibner's Sons. p. 93. ^ Gurney, O. R. (1966). The Hittites. Baltimore, Maryland: Penguin Books. p. 23. ^ a b c d Roebuck, Carl. The World of Ancient Times. p. 94. ^ Gurney, O. R. The Hittites. p. 25. ^ Gurney, O. R. The Hittites. pp. 25–26. ^ a b Roux, Georges. Ancient Iraq. ^ Windle, Joachim Latacz (2004). Troy and Homer: Towards a Solution of an Old Mystery. Oxford: Oxford University Press. pp. 121–122. ISBN 978-0-19-926308-0. ; Bryce, Trevor (1999). The Kingdom of the Hittites. Oxford: Oxford University Press. p. 60. ISBN 978-0-19-924010-4. . Beckman, Gary M.; Bryce, Trevor R.; Cline, Eric H. (2012). Writings from the Ancient World: The Ahhiyawa Texts (PDF). Atlanta: Society of Biblical Literature. p. 6. ISSN 1570-7008. At the very least, perhaps we can say that the Ahhiyawa Problem/Question has been solved and answered after all, for there is now little doubt that Ahhiyawa was a reference by the Hittites to some or all of the Bronze Age Mycenaean world. ^ Gurney, O. R. The Hittites. p. 110. ^ a b c Gurney, O. R. The Hittites. p. 36. ^ "The peace treaty between Ramses II and Hattusili III". Ancient Egypt: an introduction to the history and culture. December 2006. ^ Gurney, O. R. The Hittites. p. 39. ^ Spielvolgel, Jackson (2011). Western Civilization. Boston, MA: Wadsworth Cengage Learning. p. 30. ISBN 9781111342142. ^ "The Hittites". all about turkey. 5 May 2017. Retrieved 5 May 2017. ^ Bryce, Trevor (17 December 2004). Life and society in the Hittite world. Oxford University Press. p. 22. ISBN 978-0-19-927588-5. Retrieved 8 April 2011. ^ "The Empire of the Hittites". The Old Testament Student. 4 (1): 32–34. 1 September 1884. doi:10.1086/469493. JSTOR 3156304. ^ Gorny, Ronald (Fall 1995). "Hittite Imperialism and Anti-Imperial Resistance As Viewed from Alișar Höyük". The Archaeology of Empire in Ancient Anatolia. 299/300 (299/300): 69–70. JSTOR 1357346. ^ "The Hittites - Resources of Ancient Anatolia". pericles press. May 2017. Retrieved 5 May 2017. ^ "Telipinus Hittite king". britannica. 5 May 2017. Retrieved 5 May 2017. ^ Eduljee (5 May 2017). "Hittites". Heritage Institute. Retrieved 5 May 2017. ^ Hrozný, Bedřich, Die Sprache der Hethiter: ihr Bau und ihre Zugehörigkeit zum indogermanischen Sprachstamm: ein Entzifferungsversuch (Leipzig, Germany: J.C. Hinrichs, 1917). ^ Siren, Christopher B. "'Hittite/Hurrian Mythology REF 1.2', Myths and Legends". Comcast.net. ^ Kershaw, Stephen P. (7 February 2013). A Brief Guide to the Greek Myths. Little, Brown Book Group. ISBN 9781472107541. ^ a b c d e f g h i j k l m n o p q Taş, İlknur; Dinler, Veysel (2015-01-01). "Hittite Criminal Law in the Light of Modern Paradigms: Searching for the traces of Modernday Criminal Law in the Past". Aramazd Armenian Journal of Near Eastern Studies. 9: 73–90. ^ a b Sayce, A. H. (1905). "The Hittite Inscriptions". The Biblical World. 26 (1): 30–40. doi:10.1086/473607. JSTOR 3140922. ^ a b c d e f g h i j k l m n o Roth, Martha. "Law Collections from Mesopotamia and Asia Minor" (PDF). Writings from the Ancient World Society of Biblical Literature. 6: 213–246. ^ a b c Hoffner, Harry A. (1981). "The Old Hittite Version of Laws 164-166". Journal of Cuneiform Studies. 33 (3/4): 206–209. doi:10.2307/1359903. JSTOR 1359903. ^ a b c d e f g h i j k l m n o David., Coogan, Michael (2013). A reader of ancient Near Eastern texts : sources for the study of the Old Testament. New York: Oxford University Press. ISBN 9780195324921. OCLC 796081940. ^ King James Bible, 2 Kings 7:6: For the Lord had made the host of the Syrians to hear a noise of chariots, and a noise of horses, even the noise of a great host: and they said one to another, Lo, the king of Israel hath hired against us the kings of the Hittites, and the kings of the Egyptians, to come upon us. ^ Woudstra, Marten (1981). The Book of Joshua. Wm. B. Eerdmans Publishing. p. 60. ISBN 978-0-8028-2525-4. and Trevor Bryce, The Kingdom of the Hittites, p. 389 ff. ^ "Full text of "Hittites, Mittanis & Aryans Indo Aryan Superstrate In Mitanni Internet"". archive.org. Retrieved 2018-08-14. Bryce, Trevor R. (2002) Life and Society in the Hittite World, Oxford. Ceram, C. W. (2001) The Secret of the Hittites: The Discovery of an Ancient Empire. Phoenix Press, ISBN 1-84212-295-9. Forlanini, Massimo (2010). "An Attempt at Reconstructing the Branches of the Hittite Royal Family of the Early Kingdom Period". In Cohen, Yoram; Gilan, Amir; Miller, Jared L. Pax Hethitica: Studies on the Hittites and Their Neighbours in Honour of Itamar Singer. Otto Harrassowitz Verlag. Güterbock, Hans Gustav (1983) "Hittite Historiography: A Survey," in H. Tadmor and M. Weinfeld eds. History, Historiography and Interpretation: Studies in Biblical and Cuneiform Literatures, Magnes Press, Hebrew University pp. 21–35. Hoffner, Jr., H.A (1973) "The Hittites and Hurrians," in D. J. Wiseman Peoples of the Old Testament Times, Clarendon Press, Oxford. Jasanoff, Jay H. (2003). Hittite and the Indo-European Verb. Oxford: Oxford University Press. ISBN 978-0-19-924905-3. Macqueen, J. G. (1986) The Hittites, and Their Contemporaries in Asia Minor, revised and enlarged, Ancient Peoples and Places series (ed. G. Daniel), Thames and Hudson, ISBN 0-500-02108-2. Mendenhall, George E. (1973) The Tenth Generation: The Origins of the Biblical Tradition, The Johns Hopkins University Press, ISBN 0-8018-1654-8. Neu, Erich (1974) Der Anitta Text, (StBoT 18), Otto Harrassowitz, Wiesbaden. Orlin, Louis L. (1970) Assyrian Colonies in Cappadocia, Mouton, The Hague. Jacques Freu et Michel Mazoyer, L'apogée du nouvel empire hittite, Les Hittites et leur histoire Tome 3, Collection Kubaba, L'Harmattan, Paris, 2008. Jacques Freu et Michel Mazoyer, Le déclin et la chute de l'empire Hittite, Les Hittites et leur histoire Tome 4, Collection Kubaba, L'Harmattan, Paris 2010. Jacques Freu et Michel Mazoyer, Les royaumes Néo-Hittites, Les Hittites et leur histoire Tome 5, Collection Kubaba, L'Harmattan, Paris 2012. Wikisource has the text of the 1911 Encyclopædia Britannica article Hittites. This page was last edited on 1 April 2019, at 08:10 (UTC).